T-Mobile’s Chief Marketing Chief Mike Sievert spoke to CNET this morning and called this past weekend “one of the biggest weekends in the history of the company” with the launch of the iPhone 5. “We had really ambitious internal goals, and we beat them,” he said. Sievert declined to show numbers, but unconfirmed reports are telling me that T-Mobile sold around 200,000 iPhone 5 devices between Friday morning and Sunday close of business. Sievert did say that most of T-Mobile’s 3000 had lines out of the door, some of them short but it shows that customers were eager to snap up the iPhone on T-Mobile. Sievert did say that T-Mobile would likely report early sales in its second-quarter report expected to come on May 8th. Early signs also show the majority of customers who signed up for the iPhone, did so on the company’s Simple Choice plans. The real test of T-Mobile’s iPhone model will come when the next iPhone is introduced by Apple later this year. A launch at the same time as the other national carriers will be the true judge of just how well T-Mobile’s Simple Choice plans can stand up to the competitive test. Hopefully that day isn’t too far away. 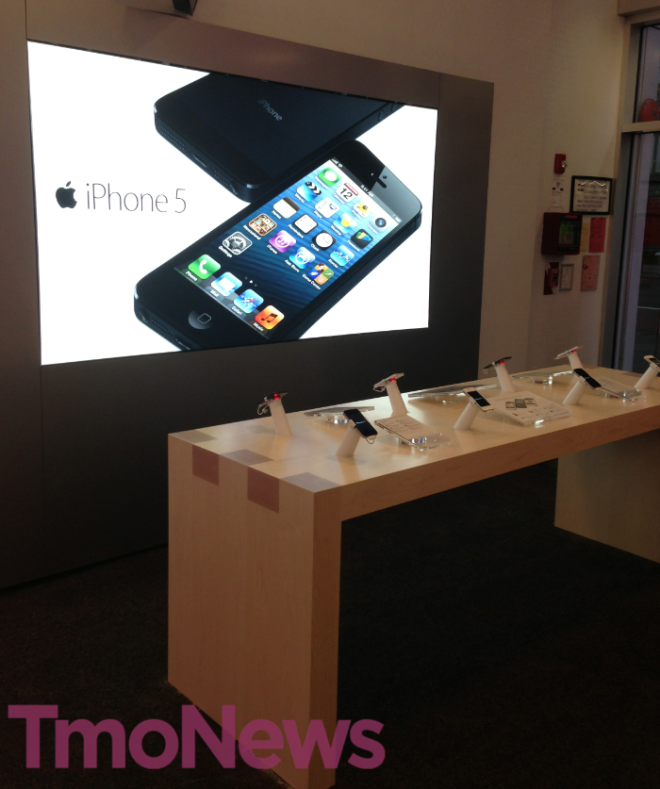 ← (Updated) Ask TmoNews: What Is T-Mobile’s New Device Unlock Policy? Remeber that they dont rely on phones, they rely on their plans and if half of the customers who bought an iphone are current clients then it will be one of the biggest. I wonder how many of these people were new customers. Ah, yes. The ever reliable word of Jack. Trusted information at its finest. I love you Herb. Just made my day! You should READ. It says they BEAT expected sales goals, not ‘happy’.. while thats not a number.. any time you beat sales expectations, thats GOOD. Only question now, by how much did they beat those expectations? I look forward to the numbers.. Being they had ~250k pre-orders and about ~250k in-store total stock.. I’m expecting to see sales figures around ~400-500k in iPhones sales for that weekend. Shows how idiotic Americans really are. What does being an American have to do with anything? I s’pose you’re an idiotic foreigner for posting an unrelated comment. What a ridiculous comment to make!!! And even more ridiculous that three ignorant people agreed with you! I bet you hit the like button yourself right!!!! Yeah it was big here. People walked by and saw the iPhone demo and bought iPhones like hot cakes when they discovered that it was only $99 upfront. Most of them were existing customers but there were quite a few new ones as well. Tmobile also temporarily lowered their credit requirements for being a “well qualified customer”. Today is the last day for that. Check again! New permanent credit qualifications announced today. All customers that have more than 24 months tenure are now considered well qualified regardless of credit class! It was April 12-15th only. There were 2 credit classes with no deposit that T-Mobile normally still does not considered well qualified, those two classes were upped to well qualified for the weekend and today. If you had a deposit when you signed up then you were still not considered well qualified. I’m telling you right now, if youve been incontract longer than 2 years, you will pay the well qualified customer pricing when you upgrade. This is what i was referring to. If you have been with T-Mobile for at least two years, you qualify for the lowest possible down payment regardless of credit. $99.99 upfront and $20.00 in 20 months, that is $499.99 for an iPhone. Where is the discount hidden? The payments are for 24 months, not 20. Thanks for the correction, and that is $579.99 for a phone with two years contract. If they want to sign up with T-Mobile, where is the discount? Same phone at Apple is $649.99. I was the last customer in the store at closing time at my local tmo store to purchase the iPhone. They said they had received 80 iPhones in stock at their location and sold 60 of them the first day. Unless they received in more, I expect they sold out over the weekend. Sweet! By the time the new iPhone drops, I’m sure there will be folks near the end of their current contracts. It will be good, good business for T-Mobile… Well that’s my hope anyways! Septermber is quite a bit more than “a few months” away. You are right – the current iPhone stops working when the new one comes out and turns into granola. Damn stupid customers who arent as smart as you. Damn Apple hippies. They turn everything into granola. And look at Verizon’s iPhone 4 sales. They sold 500,000k on launch day. I don’t know why you are calling them idiots.. Phones get outdated anyways. And the iPhone was was in the middle of its life cycle at the time. It was around 8 months old when it went on VZW. Those 500k included preorders. That’s not a lot of phones for the biggest carrier in America. Tmobile did about 250k in pre orders and the article suggests another 200k at retail stores. That’s 450k phones sold in a network of 34 million customer compared to 500k units in a network that has three times the subscriber base. So? It’s the iPhone5same. Just like the iPhone 4same there won’t be that big of a difference and the isheep will still be happy. I’m glad my happiness crosses your mind often. Makes me love humanity a little bit more each and every day. Thanks for that, Hog. I just get warm and fuzzy feelings all over knowing I made your day. Look at the GS4. Its the same as the GS3, but the Android Goats will still buy it even with those minor upgrades and bloatware. There is no major difference besides an enlarged screen and new wallpaper. The Android Fanboys are going to be leaving thinking that they have the only android phone in the world. They are upgrades comparable to the iPhone. See?? They both have nearly the same amount of upgrades while the android fanboys just blab about how the iPhone has a minor upgrade. They don’t notice the Samsung GS4’s evolution was minor. Um you conveniently forgot to mention all of the software features that Grace the S series. Call them Gimmicky or what not but at least Samsung is trying to give the consumers more in regard to that. How much software features has Apple packed into their phones? But watch just to keep within the loop Apple will start to do it with the 5s.. I think the IPhone 5’s call quality went DOWN from the Iphone 4. I had a TON on issues on that phone. All digitized sounding voice calls. The camera would lock up on the iris and I’d have to wait ” for the processor to cool down” Verizon told me this stuff. I was shocked. The audio and camera problem were known issues. I returned the Iphone 5 and went back to my 4s. I’ve wait for the 5s or 6. The 5 is really nothing to be. Actually a lot of people noticed it. There’s tons of articles about it. But it’s also not a secret that Samsung wants to be Apple. Except I wasn’t comparing the iPhone4s to the iPhone5. I was comparing the iPhone 4 to the iPhone 4Same. Correct. Even the new features in the s3 are not that impressive since they are still in developmental stages. The important thing is how many people actually use it in their day to day life apart from showing it off to other people. The android goats. Hah thats a good one. Won’t have to if your done with the site. iPhone went from being the innovator to being the imitator. Still a solid device. Just not as good as Android is now. Moron is back!!!!! Yay hoggypistol. Hopefully this translates into network expansion. Didn’t we just have an article on this or is this in some way different than that last article? The last article didn’t cover Sunday and therefore the total sales weekend. Mine did…Was sad to see I couldn’t jailbreak. Mine came with 6.1.2. Came from the Apple Store. All the ones we had in store came with 6.1.3 except the demo unit which has 6.1.2. The newer shipments are coming with 6.1.3 now. The initial stock was 6.1.2. I have a question. If I purchase the iPhone 5 with the EIP and cancel after 30 days, what happens? Would I have to pay in full at that point, or will T-Mobile bill me $20 monthly until I pay it off? Thanks. You will be billed the balance on your final bill. It’ll lock it out of all carriers nationally, and eventually internationally. T-Mobile is participating in a global effort to reduce scalping and stolen phone trafficking. Plus, I heard that they are locking IMEI’s for any unpaid phones. So cancelling and not paying the phone will lock it out of use for that carrier. now can we please stop this iPhone hate comments on this site? it’s TMONEWS. this website is all about the T-Mobile, not mobile OSes. I can see your frustration about T-Mobile carrying your most hated platform. but please, STAHP. it won’t make T-Mobile stop selling the iPhone. you’re just wasting your time. move on. Ikr, I finally got what I want the iPhone 5. Most iphone haters I’ve seen comment on here support it being on tmobile because its good for tmobile. I know personally I’ve had to talk bad about the operation system b/c some people like to push me in a corner and when that happens I come out swinging! But again, most “reasonable” android lovers are very happy that the iphone is on our beloved T-Mobile. P.S. I’m getting my mother one for her birthday at the end of May. I have no problem with an iPhone most of the time, as long as I don’t have to deal with iTunes. In fact, that’s largely why I can tolerate the iPhone 5 pretty well. It can be reasonable to expect that someone can use the iPhone 5 without ever using iTunes. That, and the 4″ screen makes it much more useful for watching media (which I do quite a bit on my phones). Im one of those reasonable Android lovers because I love the fact the iphone5 is on Tmobile . I agree. I went from an Iphone on Verizon to a Galaxy s3 on Tmobile. I prefer my Galaxy but the Iphone is good for Tmobile. I don’t want it (horrible voice call quality on the Iphone 5) but customers should have the option. Please stop saying “STAHP.” It’s the worst thing to happen to the internet since the virus. You have to call customer service or go into a store and have them do it for you. They have to run a credit check. Great news for T-Mobile. Being a Android geek I will not hate on any device. I’m just very happy that T-Mobile is on a equal playing field selling the most used phone in the USA. It would appear that the Metro deal is a go and this is another big plus for T-Mobile USA. Love it. I wanna know the actual sales for the weekend. What’s are the number? Hopefully they can release something in the next week or so. Man! I sure hope the price drops or Retentions gives me a deal on a 5 for my wife. My current plan is better than switching over to the new plans, but now I don’t get any discount. Was going to get a One as well but If I have to pay full price, I’ll settle for getting the 5 for the wife. Happy wife, happy life! I’m a devoted android fan, but quite honestly, I always felt like T-Mobile was being treated like a second rate carrier by being excluded from the iPhone. Now that we have it, it almost feels like we’re legitimized in a way. I still don’t think I’ll ever make the move to an iPhone personally, but all I can really say to T-Mobile and Apple is… “what the heck took you so long”. is crazy , i went to pay my bill to the store in union city nj and for the first time i saw this store packed , it was literally like a can of sardines!!! really? i’ll be surprised the only reason why i haven’t seen people choosing WP is due to the lack of high end WP devices, hopefully that will change in the future, do you work at this store? I’d be curious how many customers T-Mobile snagged from ATT & Vzn. Those two really need more competition!!! Do the other carriers have a payment plan? In this bad economy and the have-nots wanting to have, I suspect T-Mobile is bringing in a lot of customers that way. Good for T-Mobile, they needed something to distinguish itself from the robber barons of the 21st century. As for me, I am going to join the phablet crowd. I am getting a Note 2. I want that huge, but too huge display.